D2, Dynamic Microphone from Audix. 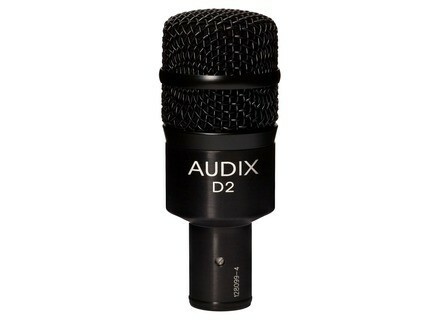 The Audix D2 is another one of the microphones from Audix's percussion line. It is an instrument microphone, designed for use on tom drums, and congas. Audix claims that the microphone lacks the muddiness of many drum microphones, but continues with claiming that the D2 manages to retain the warmth that one would want from these particular percussion instruments. Toms and congas are very meaty drums, and a drum microphone that retains this sound is very important. 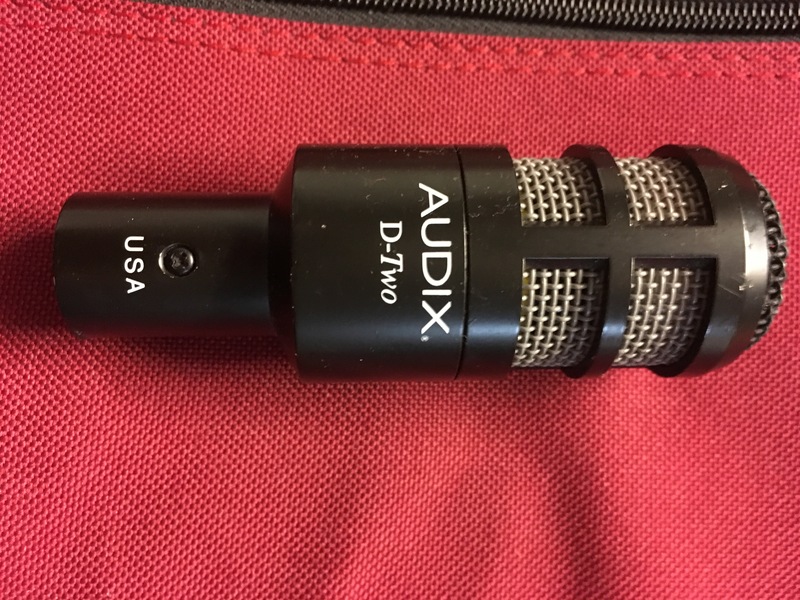 The Audix D2 contains, like many microphones from Audix, a very low mass diaphragm, improving its transient response, naturally something that many dynamic microphones struggle with. The microphone is hypercardioid, and boasts an ability to handle whopping SPLs of 144 dB. It can also isolate "each instrument's 'sweet spot.'" It has a frequency response from 80 Hz to 18,000 Hz. The D2 is also a very small microphone, measuring at under 4 inches and weighing just over a quarter of a pound. With toms and congas, this is important, as many microphones do have the tendency to get in the way and get hit by the drummer. Generally, drums microphones are also made very durable for this reason, and although the D2 stays out of the way, it can take a bit of punishment if it needs to. In use, I have found that the Audix D2 microphones are very useful on toms and congas that just need that extra warmth. However, it does in fact manage to avoid that muddy frequency bloating that can happen with less expensive microphones. They are also relatively inexpensive, so they are, in this humble reviewer's opinion, quite a steal. This is actually a microphone that I can, for its value, recommend without any hesitation to almost any drummer out there. If the warmth becomes too overwhelming (which it won't because this warmth is almost unquantifiable, but very sweet sounding) then it isn't hard to turn it down. The Audix D2 is a dynamic microphone that is suited for both use in the recording studio and in live situations. I have only used this in the studio, but because of how small and inexpensive it is, it also makes it a great option for micing drums on stage. The D2 has a polar pattern of hyper cardioid. 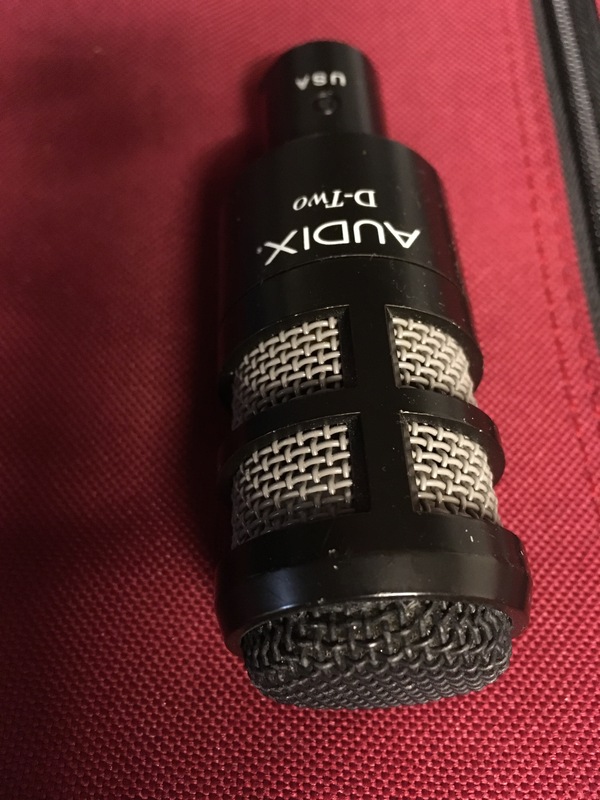 I've been using the Audix D2 dynamic mic for about four years and have found it to be a serviceable microphone. The only thing I have used this for is recording tom tom drums, and it has excelled in this situation. The size of the D2 makes it perfect to place on tom tom drums as you can place it right over the drum without it getting in the drummers way in any way. The sound quality of the D2 is adequate for this situation, and while it won't blow you away, it picks up the drums great as it is made to pick up things like tom tom drums. I would compare the Audix D2 to the other Audix mics of its kind - the D3 and D4. This series of mics are great at what they do, but don't excel too much beyond what they are best at. You could also probably record electric guitar well with the D2, but it definitely wouldn't be my first choice. The price of the Audix D2 makes it a viable option for both home studio owners and professionals alike, and I have seen it used in both situations. The price tag is really one of the best things about this mic as you can pick up a few of these if you wanted for a dirt cheap price. While there are mics that I would rather use on tom tom drums, like a Sennhesier MD 421 or a Shure SM 57, the Audix D2 does the job as well. The Audix D2 is probably the second most popular of their D line of drum mics, behind the more often used Audix D6 kick drum mic. The D2 is tailored to be used on close miking rack toms. It is light-weight and short, which makes it a lot easier to mount it on the rim of drums and still be able to point it at the skin right on, which gives you a more punchy and direct drum sound. It is a dynamic moving coil mic, so it doesn't need any phantom power. The pickup pattern is cardioid, so that will help it to reject any off axis sound from nearby drums or hi-hat. This will connect to your preamp or mixer with an XLR cable. The frequency response goes down to about 50Hz or so, which is plenty low enough for rack toms. There is a little bit of a bump around 200Hz, which is nice for making your toms sound more full and weighty. There is also a presence peak in the upper mids to help give your drums a better attack. I have been using these for a very long time on toms. I feel that they usually don't do as good of a job as the tom mic king, the Sennheiser 421, but on some drums the Audix D2 just fits better and you'll get a better sound with them. They are also a lot more convenient to physically attach the drum. I've always found the 421's very cumbersome to work with. The drum sounds you can get with the D2 tend to sound good right away, which helps to minimize time spent fussing with EQ to get a passable drum sound. The D2's are also very cheap, which means that they're going to be a great value if they're nearly stacking up with the 421's. 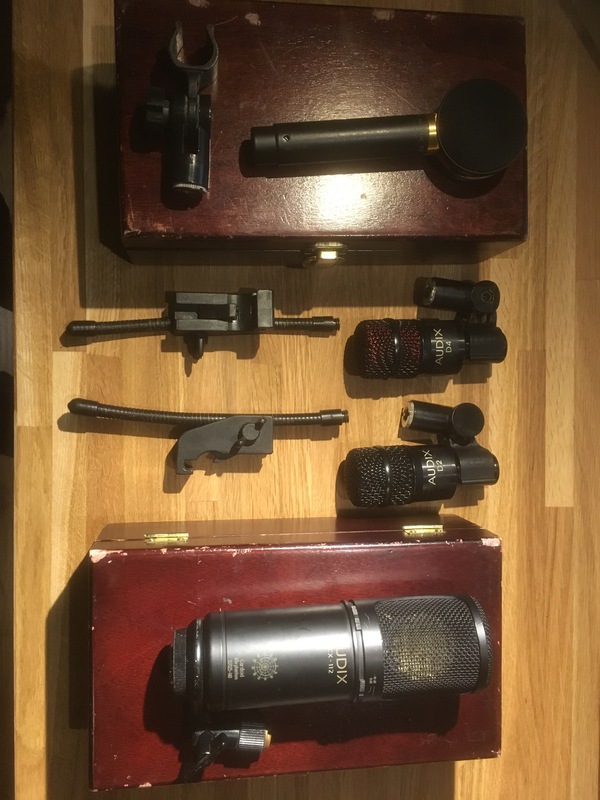 I like these mics, and would recommend them. Cardioid dynamic microphone, oriented drums (snare, tom, bass drum and jazzy in a game). it is also the brass, percussion, and guitar amps. I own two and I find them great. the studio was almost the feeling of using 421. the sound is right and punchy, new. it's really a surprise. They are very good these pickups, and I'm not ready to part with it.